For the past two Super Bowls, I’ve made stadium cakes. The sheer quantity of food that those produce would overwhelm the number of people we’d have over for the Super Bowl this year. 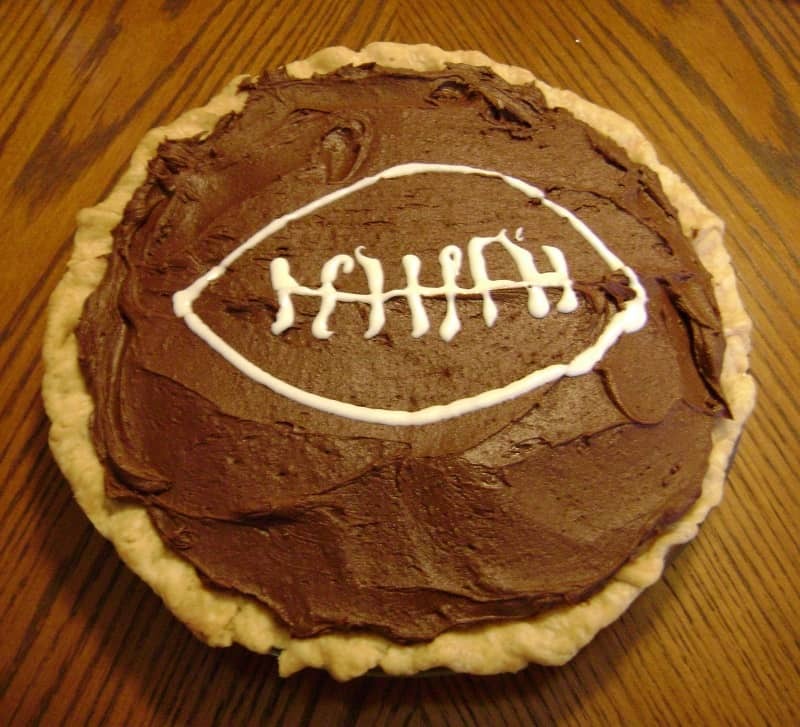 Still, the Super Bowl is the perfect time for ridiculous, over-the-top food. My friend Jackie sent me a link on Facebook last weekend that just screamed “make me for the Super Bowl!” There was no way I could resist making a Cookie Cake Pie for company. What is the cookie-cake-pie? It’s a pie crust filled with a cookie layer and a cake layer, topped with frosting. I could have added whipped topping to make it even pie-like, but I didn’t. And this iteration of it did not have pie filling, although I wish it had. I started by making a pie crust. I primarily used shortening in it, substituting in 1 tablespoon margarine when the shortening ran out. I chilled the dough before I rolled it out between layers of plastic wrap, and got it pretty thin. This was one of the better pie crusts I’ve made, and I actually think it was a waste to fill it with cookies and cake rather than pie filling. Once I lined the pie pan with the pie crust, I made a batch of chocolate chip cookie dough in my stand mixer. I put a half inch layer or so on the bottom of the pie pan. The rest I either turned into cookie cupcakes (keep reading!) or scooped cookie dough onto a cookie sheet to freeze. Once the pie crust and cookie layers were in place, I made a yellow cake batter. I used my stand mixer again because I was saving my hand mixer to make the cocoa buttercream (also linked to above) while the pie baked. I poured enough batter over the cookie layer to hide the cookie layer completely, but did not fill the pie pan dangerously full. I made the pie crust 2/3 – 3/4 full. The instructions outlined on the original recipe woefully underbaked this concoction, unless you want your pie to have gooey cake batter. I like gooey desserts, but this made me a little apprehensive. I baked my cake at 350F for at least an hour, closer to 70 minutes. This makes sense; a pecan pie takes a full hour to bake, and this pie is at least that dense. I made sure that my toothpick came out clean. So, you have leftover cookie dough and cake batter. I greased 12 muffin cups and put cookie dough in the bottom. I only put a half inch in the bottom, but I would definitely put more next time. I added enough cake batter to each cup to bring it up to 2/3 full. These I baked at 350F for 20 minutes, at which point a toothpick inserted in the center came out clean. I still had extra batter, so I made 3 plain cupcakes. If you used more cookie dough in the bottom, you would probably be able to make 18 cookie cupcakes. I made the frosting while the pie baked, and frosted the pie once it was cool. I used the extra frosting to frost whatever cupcakes I could. A little bit of this pie went a long way. It was rich, and so it was difficult to eat a lot. Honestly, I preferred the cupcakes over the pie. I didn’t think that the pie crust added much to the concoction. 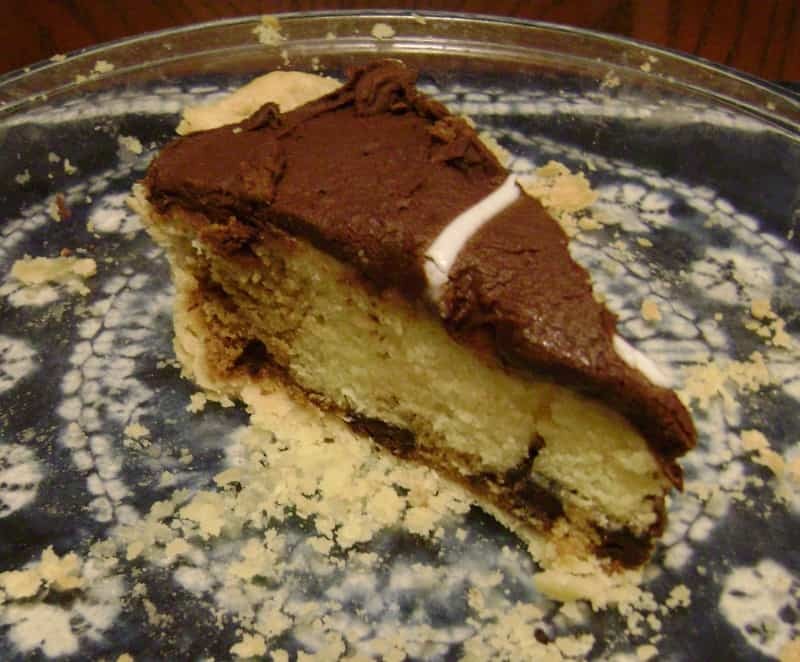 I think that the addition of a pie filling to the pie would have made it excellent – and would have likely brought it closer to a Boston Cream Pie if that filling was a custard. 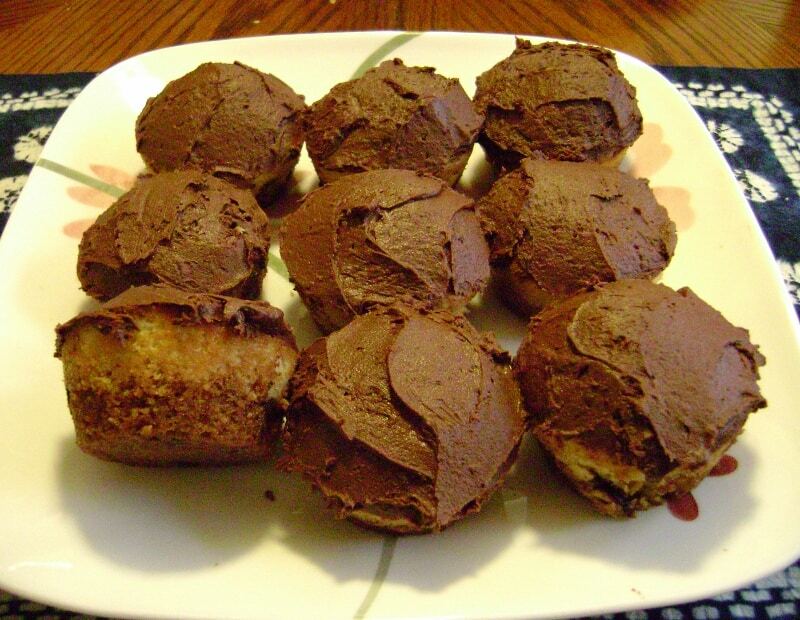 Cookie cupcakes – see the darker cookie layer at the bottom? The cupcakes, though, were excellent. They melded frosted cake and cookie, and honestly, I wish I had made the cookie layer thicker on them. Interestingly, the cookie dough starts to travel up the sides of the cupcakes (and the pie crust too) while the cake bakes. This means you end up with some amount of cookie crust along the sides of the cupcakes and lining the pie crust. In some ways, the cookie becomes a crust. The combination of chocolate chip cookie and yellow cake was great, but the contrast may have been better with a devil’s food cake, or a chocolate cookie dough. A specialty pie crust may have been a good addition here – say, a chocolate pie crust with a sugar cookie, or a shortbread crust instead of regular pastry. I’ve heard of putting a layer of Nutella or the like between the cookie and cake layers, which would probably make it seem more pie-like to me. Other ideas – a layer of fruit between cookie and topped with cake batter? Pie filling? This was time-consuming but fun to make. However, my favorite part was the cookie cupcakes. I’m undecided as to whether I’ll make the cookie-cake-pie again, but I definitely see myself making cookie cupcakes again at some point.